OK, I didn’t have an American stout handy, so I used an old Irish dry stout picture instead. Interestingly, the foam on an American stout will be much darker as American stouts get their roast character from black malt. 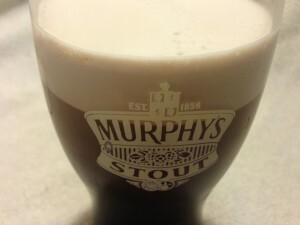 This colors the foam, unlike the roasted (unmalted) barley that is the dark grain in an Irish dry stout. This is the third beer in the second series of Surefire Extract Beers. The first series presented five homebrew recipes that played to the strengths of malt extract and stovetop brewing methods. The second series continues this idea, and started with an English best bitter. This beer is somewhat stronger than the other beers in this series, relying on the higher number of cells in a packet of dried yeast. It is an intensely roasty, aggressively hoppy stout, in some ways reminiscent of Sierra Nevada’s Stout and other similar American style stouts. I paired two distinctive American bittering hops — Chinook and Columbus — with Cascade for flavor and aroma. With summer on its way, I named the stout after the large weather systems that tear through the American Midwest every year. As a kid, I used to love watching the lightning from a big thunderstorm. As an adult, I still love it . . . the only thing that’s changed is that now I have a beer in my hand while I watch. A dark, roasty, and fairly strong American-style stout, with lots of hops.